The "kind of detectors that made great serendipitous discoveries : neutrinos from SN1987A, neutrino oscillations" were first built to look for proton decay ... that "has not been observed to date, and who knows what future proton-decay detectors may uncover" wrote Alvaro de Rujula in arxiv.org/abs/hep-ph/0404215. 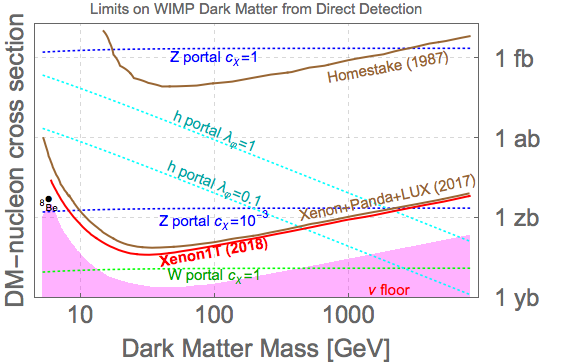 Dark matter direct detectors have not yet produced any serendipitous discoveries ... but what if the next hint of physics beyond the standard model was waiting for us in the neutrino background of dark matter detectors? How come no one talks about dark matter of the same mass range but only interacts via gravity. Isn't that a reasonable proposition even in supersymmetry/string models? If one could guess the kind of fish waiting for Dark Matter trawlers in the neutrino sea that would not be serendipitous discovery anymore. What about non-standard interactions? If we didn't get success for standard spin-dependent and spin-independent interactions, would it be right to say that this is the picture with non-standard interactions also? I am curious to know. WIMPS could of course be much heavier than the 10 TeV you mention in the article. To both explain leptogenesis and the small mass of the left-handed neutrino, the Seesaw Majorana mass needs to be on the order of 4*10^10 GeV. While this number is well above the energy at the LHC, if Type I Seesaw is the correct model, there should be indirect signs at LHC. For example, in the Seesaw model, there is still a Yuakawa coupling of the left-handed neutrinos with the Higgs field (and right handed anti-neutrinos.) This would show up as an invisible decay of the Higgs bosons into neutrino pairs. To explain leptogenesis and the small mass of the left-handed neutrino, the Higgs boson should decay into tau-like neutrinos roughly with the same branching ratio as it decays into tau leptons. ATLAS and CMS both constrain decay into invisible particles like neutrinos, but so far, the constraints do not rule out these Type I Seesaw models. What are your thoughts on Type I Seesaw Models with Majorana Masses near 10^10 GeV? Jester, what is the rationale for dark matter interacting with regular matter at all (other than gravitationally)? Are there any indications for that theoretical or empirical, other than it's something that can be probed? Currently there is no robust experimental indications for non-gravitational interactions between dark and ordinary matter. Theoretically it seems plausible: given that the amounts of dark and baryonic matter in the universe are similar, it is natural to think that the two could talk to each other in the early epoch of the universe when their abundances were set. But it doesn't have to be so, and one can easily construct models where baryonic and dark matter are produced by completely independent mechanisms. Thanks Cédric, yes, I agree, that's at least one interesting potential use of the future WIMP detectors. "How come no one talks about dark matter of the same mass range but only interacts via gravity. Isn't that a reasonable proposition even in supersymmetry/string models?" Because any truly "sterile" dark matter can't be detected in a direct dark matter detection model, and such particles don't really have a place in the most straightforward supersymmetry/string models, which generally utilize the weak interaction or something like it to cause all but the lightest supersymmetric particle to decay rapidly with the LSP remaining as a dark matter candidate due to R-symmetry. "WIMPS could of course be much heavier than the 10 TeV you mention in the article." The astronomy data strongly disfavor heavy dark matter candidates as they would give rise to to much small scale structure (e.g. at the scale of satellite galaxies and sub-halos of galaxies) which is not observed. The sweet spot from the astronomy data perspective is in the warm dark matter keV mass range. Strictly speaking, the question is average dark matter particle velocity rather than dark matter particle mass, but the two are tightly correlated in most scenarios. @RBS "Jester, what is the rationale for dark matter interacting with regular matter at all (other than gravitationally)? Are there any indications for that theoretical or empirical, other than it's something that can be probed?" "In cosmological N-body simulations, the baryon effects on the cold dark matter (CDM) halos can be used to solve the small scale problems in ΛCDM cosmology, such as cusp-core problem and missing satellites problem. It turns out that the resultant total density profiles (baryons plus CDM), for halos with mass ranges from dwarf galaxies to galaxy clusters, can match the observations of the rotation curves better than NFW profile. In our previous work, however, we found that such density profiles fail to match the most recent strong gravitational lensing observations. In this paper, we do the converse: we fit the most recent strong lensing observations with the predicted lensing probabilities based on the so-called (α,β,γ) double power-law profile, and use the best-fit parameters (α=3.04,β=1.39,γ=1.88) to calculate the rotation curves. We find that, at outer parts for a typical galaxy, the rotation curve calculated with our fitted density profile is much lower than observations and those based on simulations, including the NFW profile. This again verifies and strengthen the conclusions in our previous works: in ΛCDM paradigm, it is difficult to reconcile the contradictions between the observations for rotation curves and strong gravitational lensing." "It is now well established that, whatever the manners the baryon effects are included in the collisionless CDM N-body cosmological simulations, if the resultant density pro- files can match the observations of rotation curves, they cannot simultaneously predict the observations of strong gravitational lensing (under- or over-predict). And for the case of typical galaxies, the reverse is also true, namely, the SIS profile preferred by strong lensing cannot be supported by the observations of rotation curves near the centers of galaxies." "The more we go deep into the knowledge of the dark component which embeds the stellar component of galaxies, the more we realize the profound interconnection between them. We show that the scaling laws among the structural properties of the dark and luminous matter in galaxies are too complex to derive from two inert components that just share the same gravitational field. In this paper we review the 30 years old paradigm of collisionless dark matter in galaxies. We found that their dynamical properties show strong indications that the dark and luminous components have interacted in a more direct way over a Hubble Time. The proofs for this are the presence of central cored regions with constant DM density in which their size is related with the disk length scales. Moreover we find that the quantity ρDM(r,L,RD)ρ⋆(r,L,RD) shows, in all objects, peculiarities very hardly explained in a collisionless DM scenario." "Evidence that Cold Dark Matter (ΛCDM), CDM+ baryons and its proposed tailored cures do not work in galaxies is staggering, and the CDM wimps (DM particles heavier than 1 GeV) are strongly disfavoured combining theory with galaxy astronomical observations." "Dark matter and neutrinos provide the two most compelling pieces of evidence for new physics beyond the Standard Model of Particle Physics but they are often treated as two different sectors. The aim of this paper is to determine whether there are viable particle physics frameworks in which dark matter can be coupled to active neutrinos. We use a simplified model approach to determine all possible renormalizable scenarios where there is such a coupling, and study their astrophysical and cosmological signatures. We find that dark matter-neutrino interactions have an impact on structure formation and lead to indirect detection signatures when the coupling between dark matter and neutrinos is sufficiently large. This can be used to exclude a large fraction of the parameter space. In most cases, dark matter masses up to a few MeV and mediator masses up to a few GeV are ruled out. The exclusion region can be further extended when dark matter is coupled to a spin-1 mediator or when the dark matter particle and the mediator are degenerate in mass if the mediator is a spin-0 or spin-1/2 particle." The DM riddle would be easy cake for 1.8 eV neutrinos. They are "strongly ruled out", but soon Katrin will do the absolute test. For lensing by the galaxy clusters A1689 and A1835, thermal pseudo-Dirac neutrinos perform well, unlike other proposals like NFW, isothermal, thermal bosons, MACHOs made of axions or not, or primordial black holes. Galactic DM should then be baryonic, zillions of Earth mass Machos, also "ruled out". Cold dark maatter is the simplest explanation for the mass discrepancy in astrophysics and cosmology. According to our understanding of physics and our prejudices. However as nature has shown us many times before, she does not give a damn about our understanding of her nor our prejudices. @andrew, thanks for these links so if my understanding is correct there may be indications that just gravitational interaction with DM wouldn't be sufficient to explain cosmological observations like galaxy dynamics (or cooler than expected gas in the early Universe?). I'd like to understand though what would be the confidence level of these arguments, even on a scale from "perhaps" to "should"? I've always thought the next prefix ought to be "xacto-", like the knife. Glad you're back, even if physics is over.